The job of a dental assistant requires a set of skills that helps both the dentist and the patient. It is their job to ensure the patient is comfortable, calm and well informed about the procedure. It is also the dental assistant’s duty to assist the dentist in performing vital. Depending on where the dental assistant chooses to work, they could be working with adults and the elderly or children as young as one or two years old. Because of this, it is important that they have the proper chairside skills to ensure the comfort of all of the patients they see during a typical workday. Dental assistants perform a wide range of duties and are often considered the back bone of the dental office. Most dental assistants will greet the patient and bring them to the exam room. The dental assistant is the first person that the patient will see when going for the actual procedure and before sitting in the chair. Most dental assistants are also responsible for taking x-rays of patients’ teeth. Dental assistants are required to help prepare the exam room for treatment and to assist the dentist chairside while the procedure is being performed. Lastly, the dental assistant is required to clean the operatories and sterilize all equipment prior to the next usage. .
Because a dental assistant will see many patients on any given day, they will need to have the necessary set of chairside skills for the optimal comfort of their patient. Skill #1: Compassion – Studies have shown that more than half of the population is afraid to go to the dentist. An even smaller portion of individuals have a condition known as dentophobia, where they have an intense fear and worry about going to the dentist. The dental assistant needs to show compassion to these patients and to let them know that they are available if and when the patient needs them. A caring smile and compassionate tone can be all that is needed to calm the worries of a patient who is terrified to sit in a dental chair. Skill #2: Patience – Many dental procedures take anywhere from 30 to 60 minutes to complete. The dental assistant is usually beside the dentist during the entire appointment. The dental assistant will need to have the patience required to sit for a relatively long period of time. This is especially vital if the dental assistant works in a dental surgeon’s office where longer and more in-depth procedures are being performed. Skill #3: Knowledge of Procedures – It is the dental assistant’s job to have the room set up prior to procedures and to know what supplies are needed during each part of the procedure. This is where it is important for the dental assistant to have a clear understanding of all the dental tools, procedures and materials that are needed along the way. Skill #4: Calm Demeanor – Many patients are nervous prior to and during their appointment, even if they are an adult and have been to the dentist hundreds of times. This is where a calm demeanor comes in handy. The soothing presence of a composed dental assistant allows the patient to calm down. Composure comes with a working knowledge of the dental procedures to be performed, as well as a good working relationship with the dentist. These elements improve a dental assistant’s chairside skills. Skill #5: Foresight – The dental assistant needs to have the foresight to know what the dentist or patient is going to need before it is needed. For example, for a simple filling procedure, the dental assistant needs to know the specific steps of the procedure to ensure that it goes smoothly and without interruption. Attending a good school to become a dental assistant is of the utmost importance because that is where a dental assistant will learn about all of the various dental procedures and what is expected to work with the dentist chairside. Skill #6: Accuracy – Most people think that dental procedures are solely performed by the dentist, but actually there aremany duties that the dental assistant performs that are crucial to the patient’s oral and dental health. For example, when the dental assistant takes an x-ray of a patient’s mouth, the x-rays need to be accurate in order to be read correctly to detect underlying problems. Accuracy comes with both education and practice. Learning dental assisting from a book is ideal to get started, but the real skills begin with hands-on experience working with patients. Skill #7: Understanding – Patients may come into the dental office afraid, nervous and even angry. Having a good understanding about people and being able to put oneself into the patient’s shoes will assist greatly in connecting with the patient and ensuring a successful appointment. Skill #8: Helpfulness – A dental assistant needs to be as helpful as possible to both the dentist and the patient. They need to be able to discuss various aspects of the procedure and the patients’ needs with the dentist. When speaking with patients, the dental assistant must also be helpful in educating them about what to expect prior to, during and after their procedure. Becoming a dental assistant is a wonderful career choice that can lead to a variety of opportunities within the dental field. Some dental assistants go on to become RDAs (registered assistants) while others become hygienists or even dentists! By possessing the proper chairside manner, the dental assistant can ensure the comfort and safety of both the patients and the dentist. 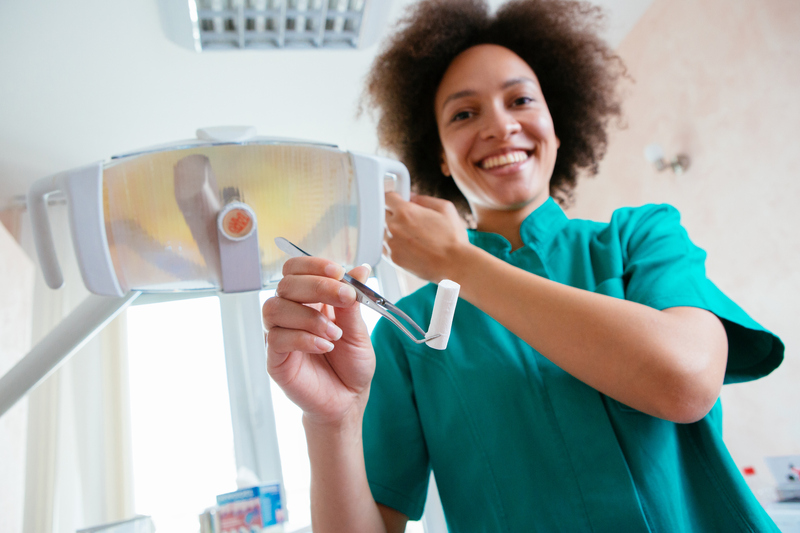 Did learning about dental assistant chairside skills interest you? Still deciding whether you want to become a dental assistant? Ready to learn more about a program that will help you become a dental assistant? The Dental Assistant Program prepares a graduate to work as an entry-level Dental Assistant, Dental Receptionist, Office Manager or Dental Hygienist Assistant in a dental office, specialty practice, or dental clinic. PCI Health Training Center Richardson, TX Campus offers the Dental Assistant Program. Contact PCI Health Training Center for more information on how to become a dental assistant and start a rewarding career today.